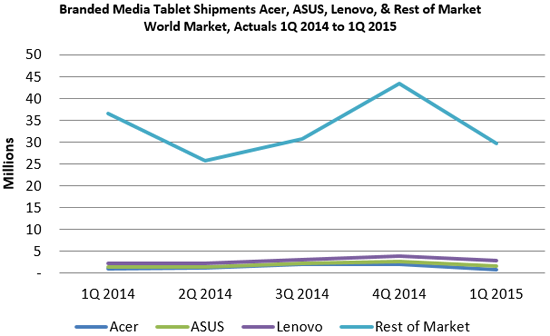 For branded tablets, the year 2015 is off to a rocky start. For the first time since inception, the popular consumer item experienced its largest QoQ decline to date of 35%. In addition, tablets experienced its largest YoY decline of 16%. According to marketing intelligence firm ABI Research, there is no denying the market is losing its momentum and leading vendors are feeling the squeeze. Apple and Samsung have been key market players and continue to dominate a significant majority of the tablet market. “2015 is the pivotal year for smaller, competing vendors to step-up, build their business, and gain market share in advanced and emerging markets,” says Senior Practice Director Jeff Orr. “The tablet market lacks a truly competitive playing field needing a strong third even fourth vendor to drive the market out of stagnation.” Acer, ASUS, and Lenovo all show promise for claiming those spots but need to focus on building their businesses especially in markets where purchase decisions are still largely to be made. The slowdown does not necessarily mean the end of the tablet market. Tablets are still popular among consumer households and even have a practical purpose for many businesses and the education sector. The underlying issues of this specific device are longevity of use, price, and market competition. The market is simply adjusting to tablets finding their niche. “That initial growth the market experienced may never happen again for tablets, but they are still a strong force in the market,” continues Orr. This year could be defining for tablets with ABI Research expecting the market to remain relatively stagnant unless smaller vendors manage to shake up the market and create a truly competitive landscape. And the potential for that realignment still remains.